Roundabout Acres: Roundabout Acres First Lamb of 2009! This morning I arrived home from work, walked to the barnyard and started counting ewes. Cheviot ewe 23 was missing. 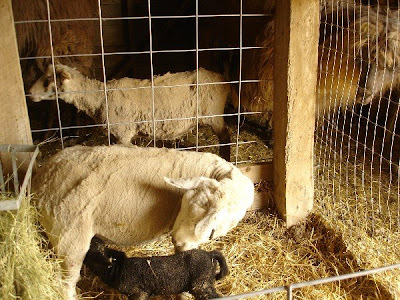 I walked around to the back of the barn and there she was - with a just-delivered black ewe lamb. Yeah! 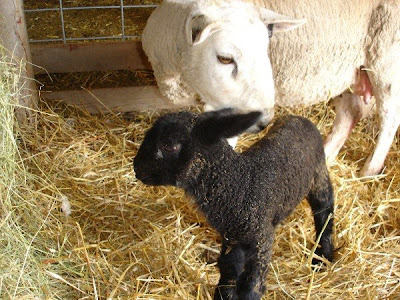 Our first lamb of 2009 and our first BFL X lamb. Exactly 145 days since our Bluefaced Leicester Dougal was put in with his girls. I watched the little darlin' take her first steps, noting how long and gangly her legs are compared to the Shetlands. Also, her hooves are HUGE compared to the Shetlands! Mom didn't want to go in the jug so that caused a bit of stress. But I was relieved that she kept knickering to her lamb through the fencing. I called into the house to my husband; he came out and helped me coax her inside the jug. Little Helena found mom's milk spigot right away and that long tail started wagging! In the picture below you can see the white "teardrops" below her eyes. This from the BFL and is called the English Blue pattern. (Becky, please correct me if I have that wrong.) She also has white along the edges of her ears. 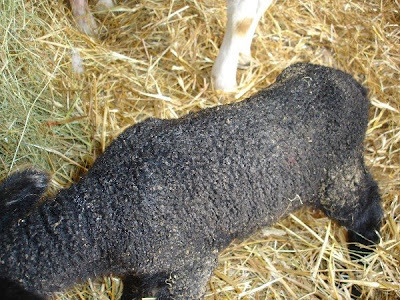 Ewe 23 is a first time mom. She didn't want me getting close to her lamb; she was already stressed from the jugging so I gave them a little time before I "clipped and dipped" the umbilical cord. Last year, I didn't weigh any of the lambs. This year I want to keep track of how they grow, especially since we are breeding crosses, some of which will be destined for the freezer. Helena weighed in at 11# even. I couldn't strip mom's teats because she was annoyed with me. Fair enough. I heard the little slurpy sounds from Helena while she was nursing. I gave mom some molasses water, minerals, hay and a grain mixture. She was hungry! As the lamb's bleats grew louder the greeting party came running into the barn. Five llamas and 13 other ewes were crowded around one jug. Especially interested was Nessarose, our llama who has been due for 20 days now. If she IS pregnant, maybe this will give her incentive to deliver that cria! If not, that's okay. We will try again for next year. After I came out of the barn, I looked around to see who would be next. I took this picture of Cheviot ewe #7. She looks like she is smiling. Perhaps she is planning on lambing next.... Also, take notice of that wide stance - no this is not normal. Her bag is growing, growing, and growing. I really like the North Country Cheviot ewes. They are sturdy, mellow and friendly. I had heard that they were flighty sheep, but so far, the Shetlands are much more flighty than these girls. Congratulations Terri! I love the Cheviot Mules too. I'm hoping to add a couple more Cheviot ewes to the flock this year. We've had 3 more born so far today, all Shetlands. Hey Congratulations on your first Cheviot Mule lamb! She's so cute. Dougal must have gotten right down to business when you put the ewes in with him. 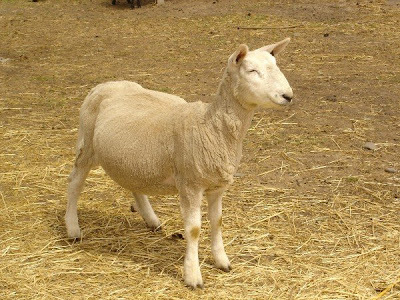 I find it interesting that you got a colored one, I knew Dougal carries color, but I'm kind of surprised that your purebred Cheviot ewe does too. I love the other Cheviot's smiling face too. I told my kids about how lambs look when they're pregnant yesterday. I showed them, too.